While Valentine’s Day may seem like it’s for the ladies, men enjoy receiving love and gifts too (even if they don’t admit it). Thankfully, there are Valentine gift ideas for him you can buy that can make the man in your life feel special – and some of them are practical, too. Talk about a win-win! As we mentioned while discussing the best Valentine gift ideas for her, don’t believe the lie that you need to spend a lot of money. 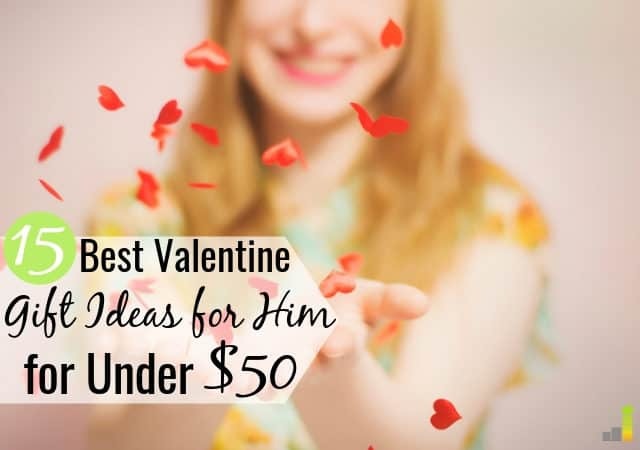 You can buy many of the best Valentine gifts for him for under $50. If you celebrate the holiday, remember that it’s the thought that counts, not the amount you spend. Are you looking for a simple and considerate gift to give your significant other this year? Here are 15 of the best Valentine gift ideas for him that fit that bill. The first on our list of the best Valentine gift ideas for him is the Fire TV Stick. This is perfect for anyone who wants to cut the cord but still wants to access their favorite content. The Fire TV Stick plugs right into your smart TV and lets you access a variety of channels and apps. Check out our Amazon Fire TV Stick channels list to see everything you can get with the device and how it works. If your significant other has been wanting a smart home of his very own, this is the perfect gift. The 3rd generation Echo Dot is new and improved, and can help your man get more done in less time. This is also the perfect gift if your spouse has quite a long “honey-do” list. In my opinion, a gift that does double-duty is pretty amazing to me. It’s like having a phone and a digital assistant all in one. This gift is a true stunner! Not only is this Engraved Pocket Knife beautiful, but it’s handy. You can’t beat that. Almost every man I know carries around a pocket knife because of its multiple uses. So if you’re really stuck on what to get your significant other, this is one of the best Valentine gift ideas for him. Simple, effective, useful, and even engraved with his initials. If that isn’t the perfect gift idea, I don’t know what is. Is your spouse a whiskey lover? Maybe he enjoys the flavor or the chill. Maybe he enjoys it with a cigar every now and then. Whatever the reason he loves a good glass of whiskey, you can get him the perfect gift set. 6 x Stainless Steel Whiskey Stones – You freeze these so they can cool down his drink without any dilution. A Realistic Revolver Freezer Case – Great for gun lovers, but it’s also practical to hold the whiskey stones. 1 x Velvet Freezer Pouch – You put this in the freezer and then wrap it around the drink. 1 x Pair Of Tongs – To grab the bullet stones. You get all of that in a novelty wooden box for under $50. He’ll be able to enjoy his luxury whiskey for years to come. Does that special man in your life wear cufflinks? If so, why not get him a pair of comfortable and personalized ones? These 925 Sterling Silver Engraved Cufflinks can be engraved with any initial, are sterling silver, and fit all men’s shirts (including those with French cuffs). They also come with a pouch for easy storage, so your spouse can’t lose them. This gift is perfect for the bearded fellas. If your significant other sports a beard and is rocking it, he needs this kit. This Beard Comb Kit makes grooming and styling his beard easy and quick. And the best part of the sandalwood comb is that it prevents the dreaded beard fuzz. Additionally, the comb is protected by a leather carrying case. This keeps the comb safe and allows for travel and on-the-go grooming. The ultimate man shoes for the house, these Double Bottom Fleece Slippers are one of the best Valentine gifts for him. Not only are they practical and comfortable, but they’re probably something he needs but won’t ask for. Who doesn’t want comfy house shoes? Since it’s still winter, these are also a perfect option for the man who needs to put on shoes to take out the dogs or grab the mail. If your significant other is sentimental and likes to keep items in his wallet, this Engraved Aluminum Wallet Love Note Insert is a great idea. This aluminum insert includes a love note telling your husband how much you love him and how you want him to come home safe. If he’s having a bad day, or is lonely from spending time away from you, this insert can brighten his spirits. Plus, it all comes in a case that keeps everything organized and dust-free for when it’s too cold to grill. However, this gift is so awesome, it may encourage your spouse to grill regardless of weather. Maybe even in the snow! This is the perfect gift for the man that has quite a few watches and no organized way to store or display them. If your husband always loses his watches, or just leaves them laying around, this Black Leather Watch Display Box is one of the best Valentine’s Day gifts for him. Not only can it hold up to 12 watches, it also has areas for rings, cufflinks, and more. This means he no longer has an excuse for throwing his jewelry wherever he feels like, and he can easily choose which of his watches or cufflinks he wants to wear. No more digging around or wasting time trying to find a matching set. And this is a gift that keeps on giving since it organizes his jewelry and prevents clutter. This Kisses 4 Us gift includes 30 cards listing different fun and flirty kisses for you and your significant other to try. This is a good Valentine’s Day gift for him, especially if he likes being flirty or even a little feisty. To use it, have him pick one new card a day or use this box for an in-home date night. Or you can even treat this as a game of hide-and-seek and hide the cards for him to find. Just don’t forget where you put them. This is a great gift option on its own, or you can pair it with the BBQ grill tool set. Either way, it’s a winner. This Kansas City BBQ Sauce Variety Pack is a delicious option for any man who’s a fan of BBQ. Do you have a husband who loves bacon but also loves sweets? Combine his two loves and get him these Melville Candy Assorted Bacon Lollipops. Sweet, smoky, and even some with a touch of maple, these are the ultimate bacon-lover’s candy. Plus, they’re individually wrapped, so he can enjoy them at any time. If your husband is anything like mine, he wears and carries the same items over and over until they basically disintegrate or are a patchwork of holes. This applies to clothes, shoes, and yes, even his wallet. If your husband hasn’t changed his wallet in the last few years, do him a favor and gift him this Passcase Bifold Leather Wallet. This wallet includes 11 cards slots, a slot for any cash or receipts he keeps, and is made from high quality, top-grain, vegetable-tanned leather. Given the high-quality construction, you won’t need to replace it for a while. Not only that, it will look better as it ages, and your significant other gets a stylish and usable option for all of his money needs. Does your husband have a game room? If so, add to his collection of games with this Bristle Steel Tip Dartboard Set. This is an official tournament size board, so it will make him feel like he’s at a bar with the boys. It also has a staple-free bulls-eye to help prevent bounce-outs. And, you don’t have to buy darts separately, because it includes two sets of steel tip darts (six in total). The best part of this dartboard set is that it is self-healing, so your husband will get a long life out of it. 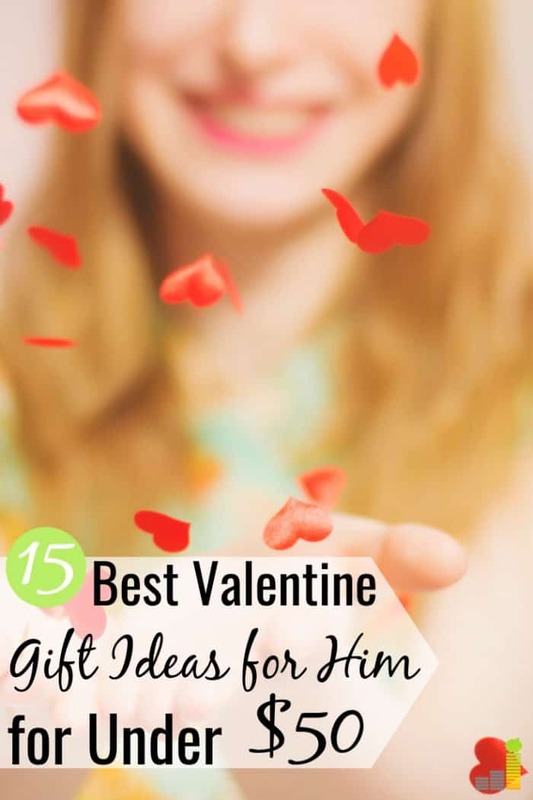 While there are many Valentine’s Day gifts for women, this list proves that there are some great Valentine gift ideas for him as well. Don’t get stuck this Valentine’s Day on what gift to give your significant other. This list is bound to have something that he needs and wants. Some might even benefit you, too! What are some other Valentine gift ideas you’ve used in the past? How much money do you budget for Valentine’s Day gifts? Do you and your partner celebrate Valentine’s Day?